Dr. Yutaka Ohno, an associate professor at the Graduate School of Engineering, Nagoya University, and his co-researchers have successfully developed a new technique to transfer microscopic patterning of carbon nanotube (CNT) thin films onto plastic substrates in one step. Their paper was published online in ACS Nano on April 1, 2014. Transparent conductive films are essential components of various electronic devices such as displays and solar panels. Indium tin oxide (ITO) is widely used as a transparent conductive film. However, since ITO contains a rare metal, the cost and the sustainability of this approach are major concerns. Therefore, the development of an alternative film has been the subject of intense research. CNT thin films have recently attracted considerable attention and their practical use has started in touch panels and displays. Nevertheless, the conventional method for transferring the film onto a substrate requires numerous chemicals and expensive devices, and also involves a complex process. As a result, the development of a new and simple technique has been widely anticipated. Prof. Ohno previously succeeded in producing flexible high performance carbon nanotube (CNT) integrated circuits on transparent substrates in 2011 and the world's first all-carbon integrated circuits in 2013, and has been leading the development of CNT thin-film formation technology worldwide. Recently, his research group has successfully developed a method to micropattern CNT thin films onto plastic substrates. This process simply involves collecting CNTs with a filter that forms a microscopic pattern and then transferring the pattern onto the plastic substrate. This novel technique has many advantages in that it can be conducted under normal atmospheric pressure at room temperature, the use of chemicals is reduced in comparison with previous methods, and 100% use of the CNT materials can be achieved. 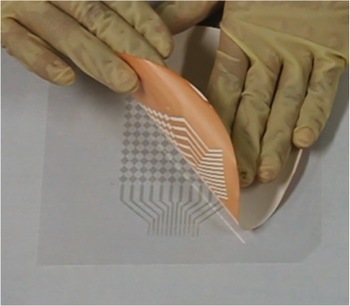 Furthermore, Prof. Ohno has used this technique to produce a touch sensor on a plastic substrate and has demonstrated multi-touch actions and the use of the substrate as a writing pad. This research will be practically applied to devices that require transparent conductive films, such as flexible touch panel devices, and will contribute to energy and resource savings and the reduction in CO2 emissions.